There was a similar topic before, but it seems it got deleted. This thread is for posting any ideas about what you would like to see this halloween, be it weapons, gears, buildings, enemies, clothing, tasks, items or even a general theme for this holiday. Anything you can think about. You can be as detailed or as simple as you want when describing your stuff; feel free to suggest stats, mechanics or simply the appearance, and hopefully some of these ideas will make the cut. What would you like to see this halloween? I kinda want to get some more stuff similar to the previous event. I like the guitar idea already though. Maybe some new weapons with special particle effects or unusual stats like the containment weapons (high kb low aps, high aps "taser" melee, more stuff that's new). Maybe aim to get that or some oddly hellish weapons. But what I still really hope for are unusual combinations of stats which normal guns cannot offer. It gives the premium stuff a bit of an edge to them. 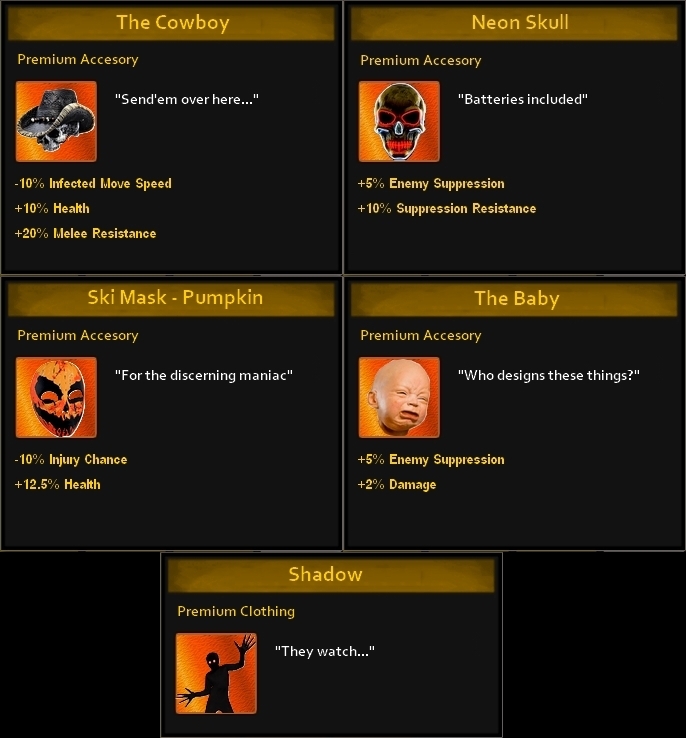 But seriously, all the weapons/gear for Halloween this year are likely already done at this point. Developers usually start holiday stuff 2-3 months in advance (minimum) so there aren't any hiccups close to the deadline, which for a holiday they can't push. Doesn't mean we can't have fun coming up for Ideas for next year though. Wow, you've really done some heavy research XD. I like the ideas. ZF-1......that actually would be cool, but implementing a multi function gun is quite complicated, so I don't think it'll ever happen (sadly). But I do want to see more guns like that. The Exo event was probably the best push for electric and sci-fi guns. I hope they make more like it. Maybe we'll have a single shot heavy damage Rail Gun some day XD. Thanks for the ideas, but as Zing pointed out, the theme and work on Halloween for this year is well underway. We're doing something different again, on top of the usual fare. could we have a scary clown skin for the uni elites over Halloween? How about a chainsaw like the tree trimmer from last z-mas but with a Halloween re-skin. How about reintroducing the "guzzlers gas" component so the Mag of Mayhem ballistic trap can be restocked. I'm sure those who constructed it a few years ago need the component so it can be put into reuse for compound defence. Same goes with pumpkins for the pumpkin bombs. Or how about new ballistic and explosive hollowed themed traps using the components that will be out during the event?